WOODSTOWN: 3 Jays in woods at south end of beach. CLONEA STRAND: 2 colour-ringed Sandwich Terns (adult & juvenile) at Ballinclamper today had been ringed at Sands of Forvie in NE Scotland. CLONEA STRAND: 2 2nd-summer Mediterranean Gulls at Ballinclamper. BRICKEY CANAL (nr Dungarvan): Spotted Flycatcher. DUNGARVAN: 2 SPOONBILLS at Killongford. 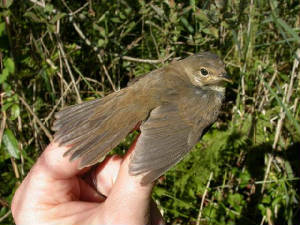 BELLE LAKE: Reed Warbler & 14 Sedge Warblers ringed, Water Rail heard. HELVICK HEAD: 130+ Swallows north in 15 mins, also a 1st-yr Mediterranean Gull. DUNGARVAN: 2 Green Sandpipers at Ballyneety, White Wagtail at the Cunnigar. CLONEA STRAND: 17+ White Wagtails at Ballinclamper. 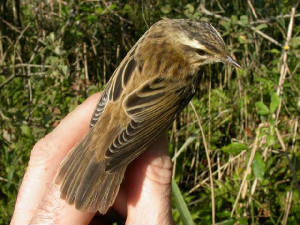 BROWNSTOWN HEAD: Migrant moths trapped overnight included a high total of 53 Dark Sword-grass. KNOCKMEALDOWN MOUNTAINS: Female or immature Hen Harrier. SEAFIELD (nr Bunmahon): 3 Green Sandpipers & 2 Kingfishers. HELVICK HEAD: Juvenile Black Tern east. 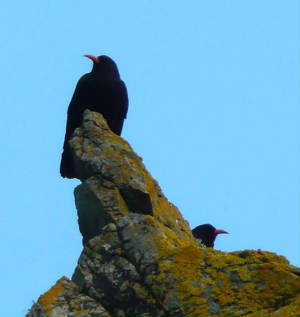 HELVICK HEAD: 3 Arctic Skuas, c3000 Manx Shearwaters feeding & 1000+ Manx west (seawatch 9:15-20:30). HELVICK HEAD: Juvenile Black Tern west, 145 Manx Shearwaters west (110 east) (seawatch 18:30-19:30). DUNGARVAN: Green Sandpiper at Ballyneety, 4 Ruff & 5 early Wigeon at Killongford. CLONEA STRAND: At Ballinclamper, a different juvenile Black Tern west, 2 Roseate Terns (adult & juvenile), Arctic Tern & adult Mediterranean Gull, and a Balearic Shearwater feeding with 130+ Manx Shearwaters close inshore. 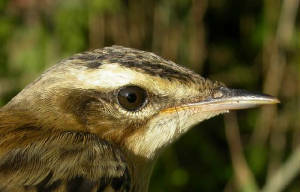 BELLE LAKE: 3 juvenile Reed Warblers & 25 Sedge Warblers ringed, 2+ Water Rails heard (1 caught). Nr LISMORE: Long-eared Owls chicks/fledglings calling again at Carrignagour. Click here to listen. BROWNSTOWN HEAD: OSPREY, Great Skua & Storm Petrel west, 540 Manx Shearwaters west (230 east) (seawatch 07:30-11:40); Balearic Shearwater west, 480 Manx west (110 east) (seawatch 18:55-20:35); also a Sedge Warbler. DUNGARVAN: 2 SPOONBILLS, 4 Ruff & juvenile Mediterranean Gull at Killongford. Nr LISMORE: Family of young Long-eared Owls heard at Carrignagour, 3 a.m.
ARDMORE: 2 adult or 2nd-summer Mediterranean Gulls. PILTOWN (nr Ardmore): 2 Kingfishers. DUNGARVAN: 2 SPOONBILLS & 5 Ruff at Killongford, 10+ Whimbrel & 3+ White Wagtails at the Cunnigar. HELVICK HEAD: 2 Balearic Shearwaters, 9 Storm Petrels, 4 Great Skuas, unidentified small skua & Puffin west (5.5 hrs of seawatches 10:30-13:00 & 17:00-20:00), also 955 Manx Shearwaters west (80E) (1st 4.5 hrs), 2 Porpoises & a Common Lizard. HELVICK HEAD: 3 juvenile Little Gulls, 3 Great Skuas, 3 Storm Petrels & c3500 Manx Shearwaters (seawatch 18:20-20:00). DUNGARVAN: 4 Green Sandpipers again at Ballyneety. DUNGARVAN: 4 Green Sandpipers at Ballyneety. HELVICK HEAD: 6 Great Skuas & a Storm Petrel (seawatch 19:30-20:20). ARDMORE: 2 adult Mediterranean Gulls at harbour. HELVICK HEAD: 2 Balearic Shearwater, 1000+ Manx Shearwaters & a Puffin (seawatch 19:15-20:30). BALLYVOONEY: 40+ Common Scoter west. BROWNSTOWN HEAD: 5 Balearic Shearwaters west, 5200 Manx Shearwaters west (1005 east) & 7 Common Scoters west (1 east) (seawatch 17:35-19:05); 650 Manx Shearwaters feeding (12:15-13:13); Tree Sparrow & Spotted Flycatcher. BELLE LAKE: Green Sandpiper & Water Rail heard, 17 Sedge Warblers ringed. HELVICK HEAD: Puffin, adult summer Red-throated Diver & 100+ Manx Shearwaters(seawatch 09:30-10:20); Balearic Shearwater feeding (17:00-17:20). DUNGARVAN: 2 SPOONBILLS & 2 Water Rails at Killongford. CLONEA STRAND: 2 Sooty Shearwater & Great Skua off Ballinclamper. BROWNSTOWN HEAD: *YELKOUAN-type SHEARWATER on sea (potentially 1st Irish record) watched 2030-21:05 (details); also 500+ Manx Shearwaters on sea. DUNGARVAN: 2 SPOONBILLS & a Spotted Redshank at Killongford; 2 Ruffs, adult Mediterranean Gull & 3 Arctic Terns at the Cunnigar; adult Mediterranean Gull at Barnawee. Barn Owl seen at 11:30. DUNGARVAN: 2 SPOONBILLS at Killongford; 25+ Whimbrel & 150+ Ringed Plover at the Cunnigar. DUNGARVAN: 2 SPOONBILLS still at Killongford. A colour-ringed Ringed Plover at the Cunnigar (green over metal ring on right tarsus, white over red on left) had probably been ringed as an adult at its nests in Wester Ross, Scotland, in 2005. CLONEA STRAND: 2nd-summer Mediterranean Gull at Ballinclamper. 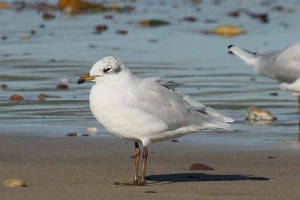 CLONEA STRAND: Adult Mediterranean Gull & adult Arctic Tern at Ballinclamper. DUNGARVAN: Adult Mediterranean Gull '3H97' off pitch & putt course. BELLE LAKE: 10 Sedge Warblers ringed, Water Rail & Green Sandpiper heard. RINCREW: Colour-ringed adult Lesser Black-backed Gull (blue ring 'YJ31'' or 'YJ37' on left leg) originally ringed as an adult at Hvaleyrarlón, Hafnarfjörður, SW Iceland, 23 Aug 2008. DUNGARVAN: 2 Green Sandpipers (Brickey River & Ballyneety), juvenile Ruff at Killongford, & 2 Mediterranean Gulls (2nd-summer with green darvic ring at Killongford, 2nd-summer at Ballinacourty). CLONEA STRAND: 3 Mediterranean Gulls at Ballyvoyle beach (2 adults & a 2nd-summer). BROWNSTOWN HEAD: Balearic Shearwater, 13 Common Scoters, Arctic Skua & 2 Great Skuas east, Pomarine Skua west, 2+ Arctic Terns (east + west) & 255 Manx Shearwaters east (225 west) (4.5 hrs seawatches 07:05-20:25). 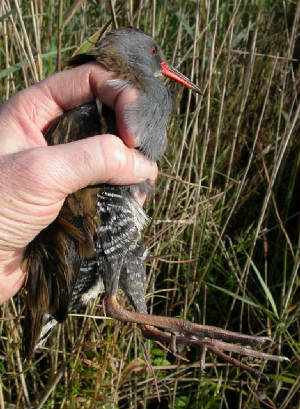 BELLE LAKE: 2 Water Rails. HELVICK HEAD: Balearic Shearwater, 3 Storm Petrels & 150 Manx Shearwaters west (seawatch 19:05-21:05). HELVICK HEAD: Balearic Shearwater (west then east) & up to 10 Storm Petrels (seawatch 19:45-20:15). BLACKWATER VALLEY: Kingfisher at Cooper's Quay. Nr FERRY POINT: Immature Glaucous Gull. RAM HEAD: 7 Fin Whales - further details on IWDG website. HELVICK HEAD: 4 Balearic Shearwaters & 3 Storm Petrels west (seawatch 18:00-19:00). DUNGARVAN: 2 SPOONBILLS, Green Sandpiper & 2 Kingfishers at Killongford, 3 Green Sandpipers & a Dipper at Brickey River. BROWNSTOWN HEAD: Balearic Shearwater, 277 Manx Shearwaters, 282 Gannets, 2 Common Scoters & a Puffin east, 9+ Great Skuas (mainly east) & 2 Porpoises; Grasshopper Warbler on land. 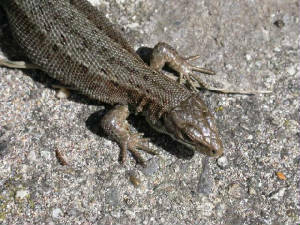 WEST WATERFORD: Corncrake heard calling by day. 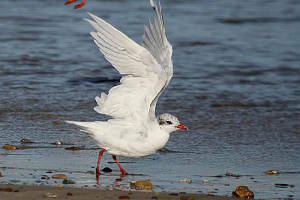 CLONEA STRAND: 3 Mediterranean Gulls (adult & 2 2nd-summers) at Ballyvoyle, Whimbrel at Ballinclamper. DUNGARVAN: 2 Green Sandpipers at Ballyneety. HELVICK HEAD: 3+ Storm Petrels & flock of 31 Common Scoter flew west. RAM HEAD: 10-12 Fin Whales - further details - also the same flock of 31 Common Scoter west. TRAMORE BACKSTRAND: 8 Common Sandpipers & a Whimbrel. BROWNSTOWN HEAD: 2 Balearic Shearwaters (1 east then 2 west), Great Skua, 1st-summer Little Gull, 9 Common Scoter, 197 Manx Shearwaters & 102 Sandwich Terns west (seawatch 18:45-20:15).